Well, it only took me a year plus a few months…today I’m finally sharing a recipe I first mentioned back when I posted about Andrew’s third birthday party. 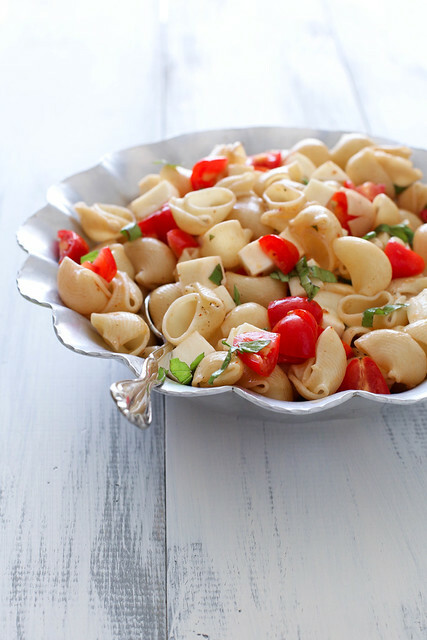 This caprese pasta salad was a sort of last minute addition to the menu. I didn’t use a recipe at the time, just threw it together on the fly. Then I mentioned it but didn’t post the recipe and ever since, I have received countless comments, emails, etc. asking inquiring about the recipe. I wanted to make it again and post about it right away but the problem is that I’m constantly overflowing with recipe ideas, plus the numerous great ideas suggested by my lovely readers, and as a result, some things just don’t get done. This didn’t get done and didn’t get done and finally last week I said enough, this is happening. Hopefully it will be worth the wait. Since I had time to consider the best approach, I refined my take on the dish a little bit and we loved the way it turned out. It’s simple as can be and it’s a lovely way to make use of the tomatoes finally ripening in the garden. The dressing is a simple mix of garlic-infused olive oil and a bit of balsamic vinegar. An ideal contribution to those upcoming Labor Day cookouts, yes? 1 lb. pasta shapes, such as shells, bow ties, etc. Cook the pasta according to package directions. Drain well. Rinse with cold water. Drain again. Meanwhile, in a small skillet, combine the olive oil, garlic and red pepper flakes over medium-low heat. Warm the oil slowly and let infuse with the garlic and chile flavors, about 5-10 minutes. Do not let the garlic burn. Set aside to cool slightly. Add the pasta to a large bowl. Toss with the olive oil mixture, balsamic vinegar, tomatoes, mozzarella, and basil until evenly combined. Season to taste with salt and pepper. Serve cold or at room temperature.